24 mm brushed stainless steel and 18K yellow gold case, domed scratch-resistant sapphire crystal with anti-reflective treatment inside, silver dial, quartz Omega 1376 movement, approximately 32 months of power reserve, stainless steel and 18K yellow gold bracelet. 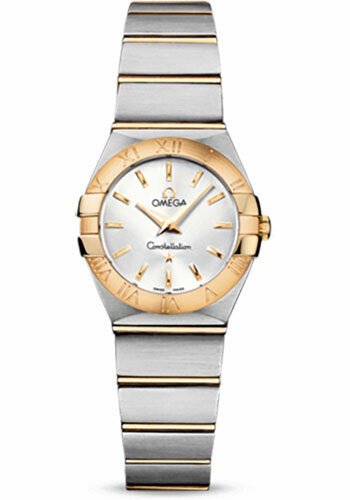 Water resistant to 100 m.
24 mm brushed stainless steel and 18K yellow gold case, domed scratch-resistant sapphire crystal with anti-reflective treatment inside, white mother-of-pearl dial, quartz Omega 1376 movement, approximately 32 months of power reserve, stainless steel and 18K yellow gold bracelet. Water resistant to 100 m.
24 mm brushed stainless steel and 18K yellow gold case, domed scratch-resistant sapphire crystal with anti-reflective treatment inside, champagne dial, quartz Omega 1376 movement, approximately 32 months of power reserve, stainless steel and 18K yellow gold bracelet. Water resistant to 100 m.
24 mm brushed stainless steel and 18K yellow gold case, domed scratch-resistant sapphire crystal with anti-reflective treatment inside, white mother-of-pearl dial with diamond hour markers, quartz Omega 1376 movement, approximately 32 months of power reserve, stainless steel and 18K yellow gold bracelet. Water resistant to 100 m.
24 mm stainless steel case, sapphire back, 18k yellow gold bezel with engraved roman numerals, domed scratch-resistant sapphire crystal with anti-reflective treatment inside, white mother-of-pearl dial with diamonds, caliber 1376 quartz movement with rhodium-plated finish, approximately 48 months of power reserve, stainless steel bracelet with 18K gold links. Water resistant to 10 bar. 24 mm stainless steel case, sapphire back, 18k yellow gold bezel with engraved roman numerals, domed scratch-resistant sapphire crystal with anti-reflective treatment inside, pink mother-of-pearl dial with diamonds, caliber 1376 quartz movement with rhodium-plated finish, approximately 48 months of power reserve, stainless steel bracelet with 18K gold links. Water resistant to 10 bar. 24 mm stainless steel and 18K yellow gold case, bezel set with tone-in-tone Roman numerals, scratch-resistant sapphire crystal anti-reflective treatment inside, Tahiti mother-of-pearl dial with 12 diamond indexes in 18K yellow gold holders which match the polished facetted hands, Omega 1376 quartz movement with rhodium-plated finish, stainless steel and yellow gold bracelet. Water resistant to 10 bar (100 metres / 330 feet). 24 mm brushed stainless steel and 18K yellow gold case, domed scratch-resistant sapphire crystal with anti-reflective treatment inside, champagne shell dial with diamond hour markers, quartz Omega 1376 movement, approximately 32 months of power reserve, stainless steel and 18K yellow gold bracelet. Water resistant to 100 m.
24 mm brushed stainless steel and 18K yellow gold case, diamond bezel, domed scratch-resistant sapphire crystal with anti-reflective treatment inside, white mother-of-pearl dial with diamond hour markers, quartz Omega 1376 movement, approximately 32 months of power reserve, stainless steel and 18K yellow gold bracelet. Water resistant to 100 m.
24 mm brushed stainless steel and 18K yellow gold case, diamond bezel, domed scratch-resistant sapphire crystal with anti-reflective treatment inside, white mother-of-pearl shell dial with diamond hour markers, quartz Omega 1376 movement, approximately 32 months of power reserve, stainless steel and 18K yellow gold bracelet. Water resistant to 100 m.
24 mm stainless steel and yellow gold case, sapphire back, diamond-set 18K yellow gold bezel, domed scratch-resistant sapphire crystal with anti-reflective treatment inside, white mother-of-pearl dial with a wavy pattern extending from the iconic claws and 12 diamond indexes, calibre 1376 quartz movement with rhodium-plated finish, approximately 48 months of power reserve, stainless steel bracelet with 18K yellow gold bars. Water resistant to 10 bar. 24 mm stainless steel and yellow gold case, sapphire back, diamond-set 18K yellow gold bezel, domed scratch-resistant sapphire crystal with anti-reflective treatment inside, champagne mother-of-pearl dial with a wavy pattern extending from the iconic claws and 12 diamond indexes, calibre 1376 quartz movement with rhodium-plated finish, approximately 48 months of power reserve, stainless steel bracelet with 18K yellow gold bars. Water resistant to 10 bar. 24 mm brushed stainless steel and 18K yellow gold case, diamond bezel, domed scratch-resistant sapphire crystal with anti-reflective treatment inside, champagne shell dial with diamond hour markers, quartz Omega 1376 movement, approximately 32 months of power reserve, stainless steel and 18K yellow gold bracelet. Water resistant to 100 m.